Harry Houdini performing his Great Milk Can Escape, 1908 (Library of Congress). Born Erik Weisz (in Hungary), Houdini changed his name to recall the great French magician Jean Eugene Robert-Houdin. His specialty was escape acts. He was for many years the highest-paid perfomer in the US and also starred in several movies. Much of Houdini’s later life was devoted to debunking spiritualists. 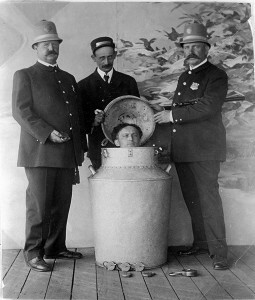 Houdini died following a ruptured appendix in a Detroit hospital in 1926, age 52. There is live footage of several of his acts. He once taught his dog “Bobby” to escape from a pair of miniature handcuffs. Just arrived: Mezcalero no. 15, a 100% semi-wild Sierra Negra (agave americana) from Baltazar Cruz in San Luis del Rio. Sierra Negra has a beautiful suavity in the mouth, with a long finish; this version is nicely fruity. It’s a big batch, too, almost 1128 bottles. If you go to www.caddellwilliams.com, next to each product there is a tab “video”. The tab takes you to a short video segment of me talking about the product: how it is made, how it tastes, etc. I urge you to try the truly extraordinary Low Gap Bourbon, distilled on the antique 17HL Germain-Robin cognac still and aged entirely in new bourbon barrels. It is, simply, one of the best bourbons out there. Germain-Robin now has a cellar rich in brandies from individual grape varietals that are 8-12 years old: pinot noir, colombard, semillon, zinfandel, viognier…. Joe Corley will draw on this wide range of distinctive flavors and aromas to assemble a series of Once Only blends, a barrel at a time, one-time releases of XO-level brandies. First releases will be in late May. We will also release small bottlings of Just Passing Through. Don Sutcliffe will be bringing in more bottlings of The Exceptional Grain and the Malt; the 1st release of the Blend will be in May or June. From Oaxaca, in addition to a year’s worth (4) of Mezcaleros, we will be getting a Los Nahuales Special distilled from wild Cuishe and the very rare Sierrudo (April) and in June a Mezcalero Special no. 2, an insanely fine Madrecuishe from Don Valente in Santa Maria Pila that has developed three years in a holding tank. Mezcal seems to respond extremely well to resting after distillation.